Article from the Union for the Mediterranean web site. Youth unemployment in those under 25 years of age is approximately 50% in Spain, where around 22% of young people ab andon the school system. The aim of Second Chance Schools of Spain (E2O) is to construct a recognised national model through an innovative pedagogical approach addressed at unemployed young people without any qualifications. It is already working successfully in other Mediterranean countries under the UfM-labelled project New Chance Mediterranean Network (MedNC). The Spanish Association of Second Chance Schools (E2O), formed in March this year, met today, in its first national meeting, with more than 150 representatives in attendance from national schools, public administration, businesses, private foundations, universities, experts in the education and social sectors, trainers and students and ex-students of Spanish E2Os. 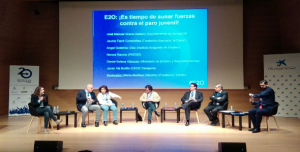 With this structure of a national network of schools, the Spanish Association of E2O wants to consolidate a common, effective and recognised pedagogical model aimed at young people between 15 and 29 years old. Its core principles can be found in an official letter, signed in November 2015 by the founding members of the Association at the headquarters of the UfM Secretariat, in Barcelona. This pedagogical model is based on an innovative education that reinforces basic job skills, individualised support for the young students and assistance in their search for active employment, while maintaining close ties with the business world. Sergi Farré, diplomatic advisor and spokesperson for the UfM Secretariat, said that the initiative is part of the regional cooperation project “New Chance Mediterranean Network (MedNC)”, supported by the 43 countries of the Union for the Mediterranean under the Mediterranean Initiative for Jobs (Med4Jobs). MedNC, promoted by the Office of Economic Cooperation for the Mediterranean and the Middle East (OCEMO), promotes the development of a Euro-Mediterranean network of accredited E2O schools that work towards the professional and social integration of young people excluded from the labour market. “Encouraging the human development and socioeconomic participation of our young people is fundamental to achieving the stability and integration that our region needs”, said Farré. During the meeting a roadmap was presented which involves extending the network by means of the addition of new members, organising a series of seminars and debates on the E2O model and defining a collaboration framework with centres that form part of the wider MedNC Euro-Mediterranean network (including E2Os in Algeria, Egypt, France, Morocco and Tunisia). The next national meeting for all E2O schools will take place next year in Andalusia. The Mediterranean Economic Week brings digital technology to the forefront!